Please click on Example Pages on the left menu to view some examples from the book. Gilligan, T. M., D. J. Wright & L. D. Gibson. 2008. 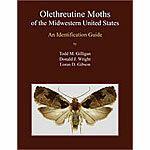 Olethreutine moths of the midwestern United States: an identification guide. Ohio Biological Survey, Columbus, OH. 334 pp.